Arguably, the Monkees were the first group to be assembled and were done so by Don Kirshner. Since then many producers or entrepreneurs have put together a bunch of studio musicians which, if successful, would evolve into a ‘proper’ group. Jonathan King did likewise with the Bay City Rollers and when it came to disco, Arthur Baker was the man for the job. Baker began working as a DJ in Boston in the mid 1970s, where he played early disco and soul for the early Boston club scene alongside famed local DJs including John Luongo and Jimmy Stuard. He had little patience for DJing, saying in an interview, “If I didn’t get a good reaction on a record, I’d just rip it off, break it up and throw it on the dancefloor.” In 1977 he turned to production and was part of the group North End in Boston, releasing 12-inch singles on West End and Emergency Records. In 1981, he moved to New York, where he continued as a producer, working with Michael Jonzun and Maurice Starr on several releases for the Posse Records label. He went on to produce for Tommy Boy Records that included producing Afrika Bambaataa & Soulsonic Force’s Planet Rock single. It combined elements from two Kraftwerk recordings, Trans Europe Express and Numbers, which were interpolated by studio musicians, rather than sampled. The track was released in the summer of 1982 and went to number one on the US dance chart although it failed to make the Hot 100 singles chart. In the UK it went to number four. Following the success, Baker launched (along with Morgan Khan) his first record label Streetwise. Later labels included Criminal Records and Pow Wow, as well as his own Shakedown Studios. In 1983, Baker found work doing dance remixes of pop and rock hits, first with Cyndi Lauper’s Girls Just Wanna Have Fun, and Bruce Springsteen’s Dancing in the Dark, Cover Me, and Born in the U.S.A. The following year he contributed the track Battle Cry to the Beat Street movie soundtrack, which he also helped produce. He also signed a then-unknown New Edition, issuing the teen vocal group’s debut single, Candy Girl, which topped the UK chart in 1983 and became the first number one with rapping on it. 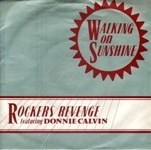 Rockers Revenge followed up their big hit with a cover of Jimmy Cliff’s classic The Harder They Come but stiffed at number 30 and by then, Baker was looking for a new project. In the mid-90s, Baker worked with soul star Al Green, writing and producing the hits The Message is Love, Love Is a Beautiful Thing and the anti-handgun song Leave the Guns at Home. The same year he bought his own restaurant called the Tiny Robot and also The Starland Social Club members bar Notting Hill. In 2006, The Visa Credit Card Company used the Baker-produced track Looking for the Perfect Beat by Afrika Bambaataa’s, which made him enough money to keep his credit check safe.